The Complete Phonics Program helps children make sense of an English language that sometimes seems to make no sense at all. It helps them dissect written English into basic building blocks of sounds and letter combinations, and teaches them how to use these building blocks to create or decode words. The program teaches them how to do this in a fun and therefore memorable way by using the arts and games. Children live in a world of imagination, music, games and fun because that is exactly where they are supposed to be. So often we, as educators and parents, try to take them out of this world and bring them into a world of learning that is stale and adult oriented. That’s when some kids just shut down. What happens then, is that things such as learning to read become a chore for many children, instead of a fun and creative learning adventure. We, as educators and parents, need to enter the childhood world of fun with a systematic learning agenda. The Complete Phonics Program does exactly that. It enters the child’s natural world of learning and engages them with activities, not only designed to suit a variety of learning styles, but also designed to be fun and emotionally engaging. As has been proven by many studies, and as evidenced by our own learning, when a person’s emotions are engaged in learning, that learning is remembered. Also, when learning is encoded using a variety of creative strategies, for example art and music, learning is remembered. We all have hundreds of songs stuck in our heads, for example, from TV theme songs of our own childhood, to current hits on the radio. There are 3 original songs in The Complete Phonics Program that have been written specifically to help your child, or your classroom of students, learn the sounds and letter combinations that make up the English language. Your children will have a great time and they might not even realize that they are learning. The Complete Phonics Program has been in development for over 15 years in my classrooms and private tutoring sessions, and it works. My own 2 boys, Keenan and Dylan, were reading junior level novels by the time they went into Kindergarten at age 5 partially because of the card games that we’d play for fun. Those games were the beginning of what is now The Complete Phonics Program. The games we played with the phonics cards that I made up taught my boys to learn the sounds and letter combinations found in the English language in a creative, musical, fun, and therefore, unforgettable way. When children don’t have to struggle with understanding words in a story, they can focus on the meaning and joy of reading. My boys are still hooked on reading, and have been known to walk out to our car wearing only socks, when there was snow on the ground, because they had their noses buried in books. Working with students on a one to one basis is a teacher and parent’s dream and naturally produces better results than what one would expect in a classroom setting. A private tutoring client of mine, Brian aged 10, was having difficulty reading, and his spelling was well below grade level. The school contacted his parents to let them know that he was being considered for a placement in special education. Special education is wonderful and necessary for many students. It wasn’t necessary, however, for Brian. His parents contacted my tutoring service and, using The Complete Phonics Program with a trained tutor, Brian was able to make drastic improvements with both his reading and writing skills. He avoided being labeled as a special education student after spending two months following this program. His teacher had never seen such an improvement in reading scores in such a short time. 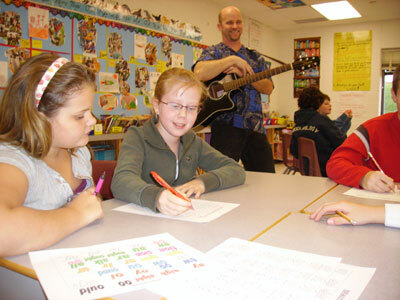 Once Brian was taught the fundamentals of letter sound combinations, he had the tools he needed to succeed. This program has achieved excellent results with many other students, particularly those in a special education setting, or those students reluctant to learn, because of the music, art, and games approach it uses. This program has not only helped children learn how to read, it has also had great success in improving students’ spelling grades. Junior classes assigned to me for a year would, on average, improve 2.7 grade levels during that one-year period by using this program twice a week for 45 minutes. At the beginning of the year, I would train parent volunteers, break the students up into groups according to their language needs and set them up in small groups with a parent tutor. There was always, inevitably, one group of students reading and spelling above grade level every year. This group consistently requested phonics time, although there was no real need for it, because the activities were so much fun. Ben R., by the way, holds my class record for improved spelling. He improved his spelling grade level by 5.1 grades in one school year. The Complete Phonics Program uses a systematic approach to teach children all the phonetic sounds in the English language and the various letter combinations that create these sounds. It teaches these things in ways that are creative, fun, multi-sensory and totally engaging for children. It provides you not only with exciting activities, but also with a tutorial lesson plan. This lesson plan is a critical part of the program and should be followed in order to achieve maximum success. It has been developed after years of teaching and is designed to introduce, teach, review, and solidify learning concepts and to motivate students. This program is called The Complete Phonics Program because that is exactly what it is, complete and total. It uses a multi-sensory approach with systematic lesson plans that allow students to encode information in a variety of ways. Visual encoding of sounds and letter combinations are paired with music, games, and fun in order to solidify learning. There are building blocks of letter/sound combinations in the English language. The Complete Phonics Program breaks down these sounds into various learning sections. One letter is responsible for one sound. One letter is responsible for one sound. The exception is the “kwu” sound, which is made by the letter combination “qu”. This is why “qu” is presented as one consonant sound. Long Vowel Sounds that Follow the Rule: “When 2 vowels go walking, the first one does the talking”. For example, the long A sound can be made by the letter combination “ai” as in the word “bait”. For example, the long A sound can be created by the placement of the letter e at the end of a word. e.g. “mad” becomes “made” because of the “magic e”. When 2 or 3 consonants are used together and still retain their individual sounds, it’s called a blend. One can still hear, for example, the individual s, t, and r in the blend “str” as in the word “strange”. This is when 2 consonants join together, lose their individual sounds, and create a new sound. An example of this is the diagraph “sh” as in the word “shine”. These are letter/sound combinations that make no sense whatsoever. We have these in written English because of tradition. These letter/sound combinations became standardized in the 1600’s when English was transformed by the spread of a standardised London-based dialect in government and administration and by the standardising effect of the printing press and the creation of dictionaries. Prior to this, there were many variations in spelling of the same words, depending on what town or village you were in. Although they make no sense at all, they are used in English, and therefore need to be taught and learned. Examples of these are: “ould” as in the word “could” or “ought” as in the word “brought”. As the “Totally Whack Rap” song says: “they make no sense, they’re all messed up, but we’ve got to learn them anyway, so listen up”. Through music, art and games, The Complete Phonics Program will give your child all the building blocks that he or she needs in order to improve their reading and writing skills, and they’ll have fun using it.